the magnetic flux is at a maximum. the magnetic flux is at a minimum. the change in magnetic flux is at a maximum. the change in magnetic flux is at a minimum. 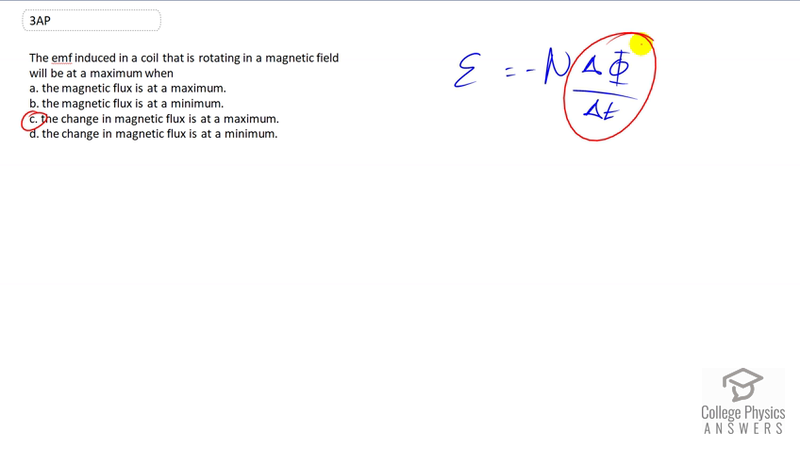 This is College Physics Answers with Shaun Dychko The emf induced in a coil is the number of turns in a coil times the rate of change of the magnetic flux through it. And there's a negative sign to say that the, you know, Lenz's Law, the emf is in the opposite direction to oppose this change. But any case, what's important here is that the magnitude of the induced emf is at the maximum when the rate of change of the magnetic flux is at a maximum. So that's why the answer is C.